Seminal Vesicle - Inflammation. 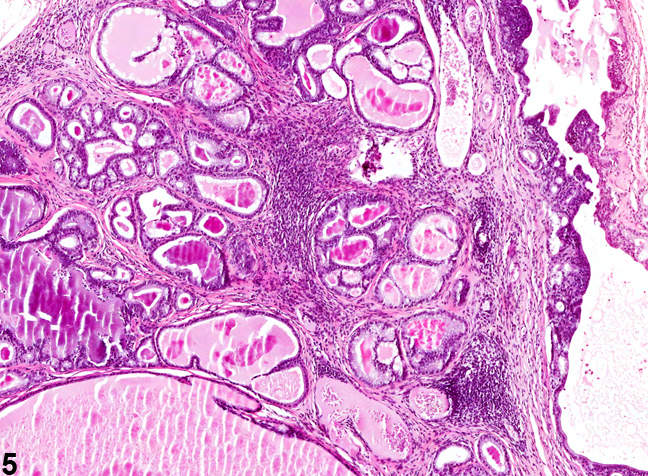 Acute inflammation in a male B6C3F1 mouse from a chronic study. Seminal Vesicle - Inflammation. 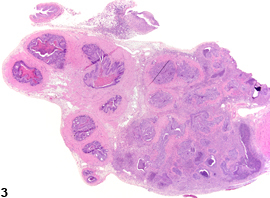 Arrow indicates an area of hyperplasia, and arrowhead points to epithelial necrosis in a male B6C3F1 mouse from a chronic study. Seminal Vesicle - Inflammation. 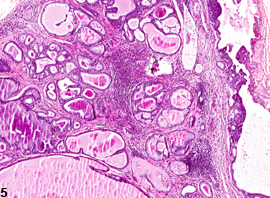 Acute inflammation in a male Harlan Sprague-Dawley rat from a chronic study. Seminal Vesicle - Inflammation. 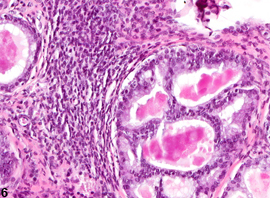 Higher magnification of Figure 3 showing squamous metaplasia in a male Harlan Sprague-Dawley rat from a chronic study. Seminal Vesicle - Inflammation. Chronic inflammation in a male B6C3F1 mouse from a chronic study. Seminal Vesicle - Inflammation. 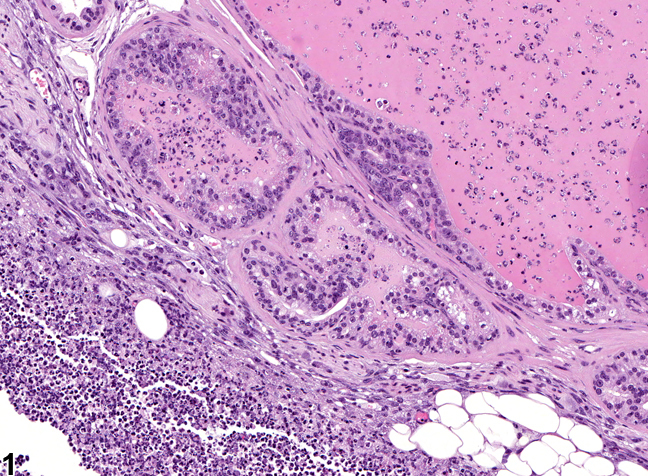 Higher magnification of Figure 5. Chronic inflammation in a male B6C3F1 mouse from a chronic study. 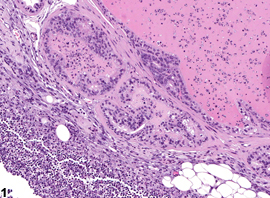 Inflammation of the seminal vesicle can be acute with a neutrophilic infiltrate in the interstitial as well as in the glandular lumen ( Figure 1 and Figure 2 ). In Figure 2 the inflammation has destroyed the glandular architecture. In Figure 3 and Figure 4 it is associated with squamous metaplasia of some affected glands. 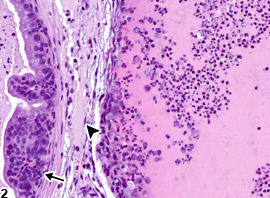 The inflammatory response may also be associated with hyperplasia (arrow, Figure 2 ) and epithelial necrosis (arrowhead, Figure 2 ). 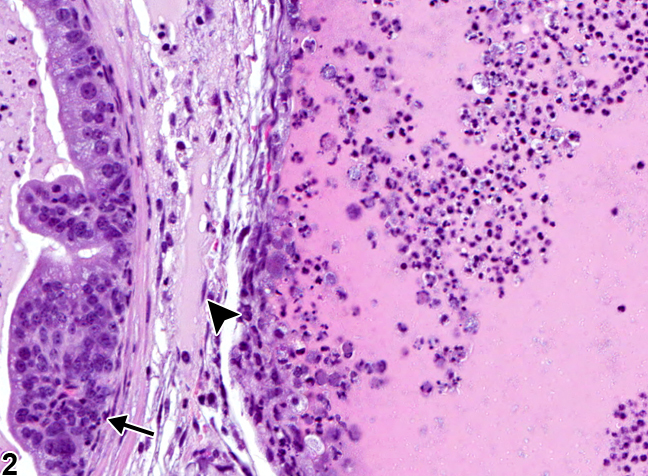 Inflammation can be a more chronic, primarily interstitial reaction, with breaking up of the mucosa into small glandular structures ( Figure 5 and Figure 6 ). Seminal vesicle inflammation is a sporadic incidental finding seen in older rats and mice. The inflammation should be diagnosed and given a severity grade. 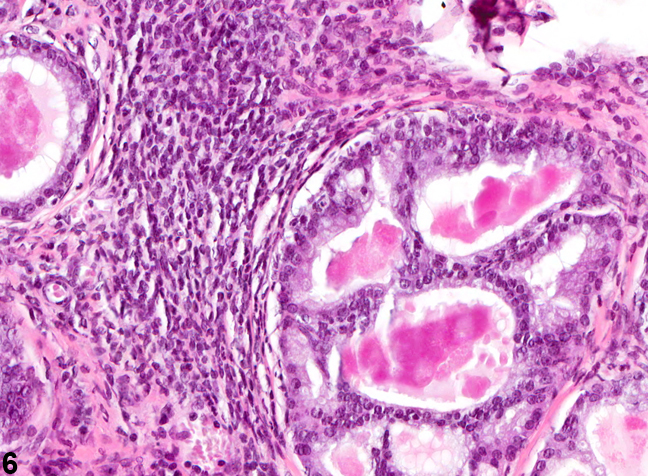 When both seminal vesicles are involved, the diagnosis should be qualified as bilateral and the severity based on the more severely affected seminal vesicle. 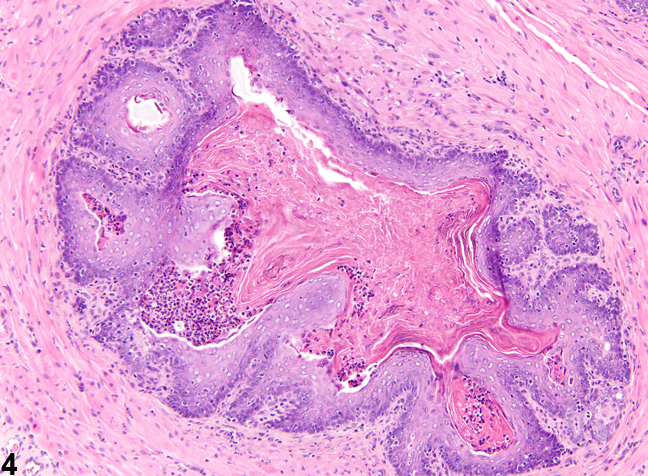 Hyperplasia and squamous metaplasia secondary to inflammation should not be diagnosed separately unless warranted by severity or especially dominant. Indication of secondary squamous metaplasia and/or hyperplasia can be described in the pathology narrative.